InfoSecurity Connect is the one-stop shop for senior Cyber Security executives from some of the top US financial services organizations; this interactive forum provides you with the opportunity to benchmark, share ideas, find solutions for your business and build lasting relationships. All in a warm, luxurious venue. This is unlike any event you've ever encountered. Data Classification is a process which is used to optimize data security and data protection programs and processes. Some even think data classification should be a first step in one’s data protection program. Most organizations have regulatory data and intellectual property (IP) sprawled all over the place, in different formats and files including unstructured data such as client documents, emails, files, scanned documents, PDFs, images, etc. Most data detection algorithms are imprecise yielding thousands of irrelevant culled data resulting in frustration, wasted time and money. What data detection techniques should be used? Which detection techniques yield the most accurate results? How can an organization accurately classify intellectual property (IP) automatically, as it is created, modified or discovered? How does an organization accurately discover and automatically classify regulatory data to stay compliant? 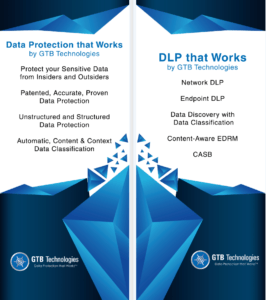 Join Uzi Yair, co-founder of GTB Technologies, Inc. and the creator of the market leading Enterprise DLP that WorksTM platform to discuss and learn best practices for data classification, data detection techniques and how to avoid the known pitfalls.